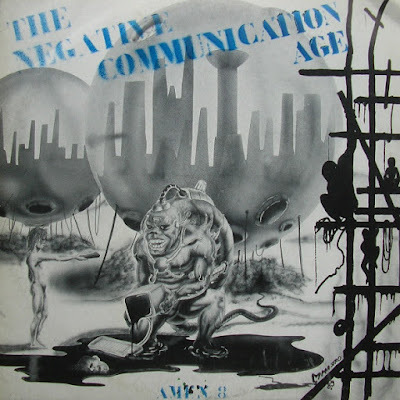 Great double lp compilation released by the incredible Amen productions, I wrote about it when I posted the magazines Amen-This Is Religgion n6 and Number 5.This amazing label: Amen THX1138 was Founded by Roberto Marchioro in 1983. Abbreviated as 'Amen'. Mostly Industrial and Experimental bands. Records released through the obscure Italian fanzine 'Amen' in the 80's. This double lp includes a nice selection of tracks and artists playing abstract, industrial, ambient and noise music. Comes in a gatefold sleeve with an 80-page b&w A4 magazine including texts and graphics from the participating artists and the floppy/flexible disc and a THX 1138 bound by a rubber band. Handmade cover, exist in different colors as green, blue, yellow, red. Some copies are pressed on transparent vinyl. Track B1 recorded at Suonovivo - Bergamo, March 1989.